I was a little surprised after the fact. I mean, I’ve tried to teach all my children general manners and especially my son to be a gentleman. This seemed like such a “DUR” thing to do. Who says goodbye to a visitor and doesn’t see them to the door? (Even though he tried to say she was his company’s company and not his responsibility. WRONG!) We did get that ironed out when we discussed common etiquette. 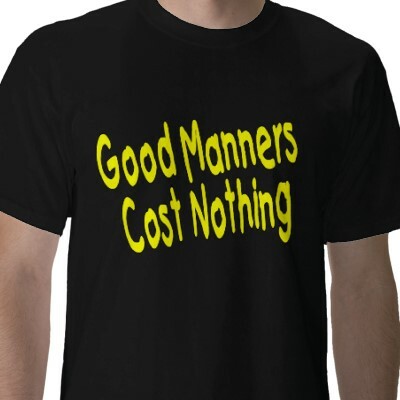 But ya know, this brings up the whole manners thing in general … especially the gentlemen’s code of ethics. I don’t blame men. I do think nice guys took a little flack awhile ago when some women (not me) were upset that they held open doors or pulled out a chair. You know that whole equality thing? But that’s so silly. If a man gets to a door at the same time as the lady, then he should hold open the door. On the other hand if that same man is balancing packages and bags, then it would just be polite for the woman to hold open the door and allow him to go through. And no one should be offended. It’s common courtesy. I walk with a walker or a cane all the time now. People go out of their way to help me with doors or step out of the way so I have a little more room when walking through a restaurant and such. I’ve had people stop by my car when I’m loading or unloading the walker and ask if I need assistance. I don’t need the help, but it would be rude for me not to be appreciative. I think it’s really nice of people to notice and I thank them for taking time to stop and ask. But it seems everywhere from the grocery store to the highway people are rushing and pushing and more worried about themselves than their neighbor which often translates to rude behavior. It’s sad really. It takes nothing to offer a smile to a stranger and give them the next place in line. Kind of makes everyone feel all warm and fuzzy. So how is it in your corner of the world? Are you noticing less manners or do you think there’s a trend moving back in the other direction?